Nintendo Switch's screen is a 6.2" (15.75cm), 720p, multitouch display, according to a new report. Nintendo says we'll have to wait until January to learn more official details about Switch, but Eurogamer's sources have given us something to chew on in the meantime. These sources include the same folks who said the console would prominently feature detachable controller segments over the summer. And hey! It totally does. For reference, Nintendo 3DS' top screen is effectively 400x240 pixels and PlayStation Vita's multitouch display is 960x544. So even though 720p sounds kinda small these days, 1280x720 is actually a decent step up for Switch's handheld configuration. And the system could almost certainly do 1080p when docked with a compatible TV, since Wii U can already handle that just fine. As for multitouch support, what happens when you can't reach the screen because you have the console docked? Switch's right Joy-Con (the little controller things that slide onto the sides of the system) allegedly has an infrared sensor, and when used in concert with a matching sensor in the docked Switch it could allow for Wii-Remote-like pointing. That's kinda like touch controls. 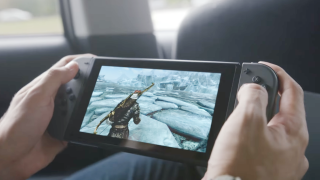 Switch's reveal trailer had a distinct lack of screen-touching and Nintendo has refused to comment on whether the console has a touchscreen since then. But the company might just be trying to keep the focus on handheld-optional, home-console-quality games until then.